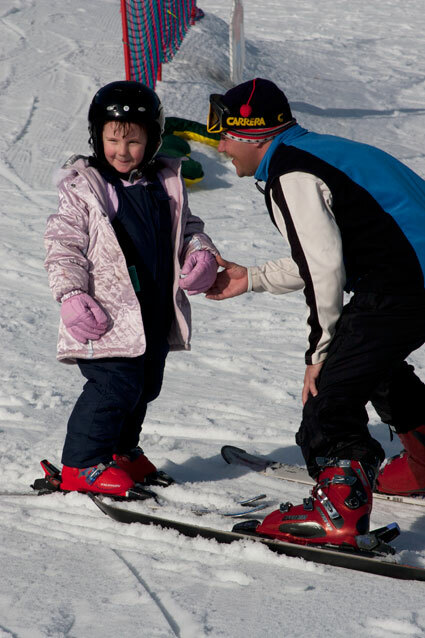 Kids learn some valuable skiing skills from one of Gunstock’s instructors. 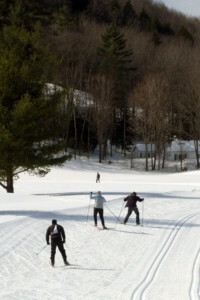 Nordic, or cross-country, skiing is a popular winter sport. Not into skiing, snowboarding or tubing? 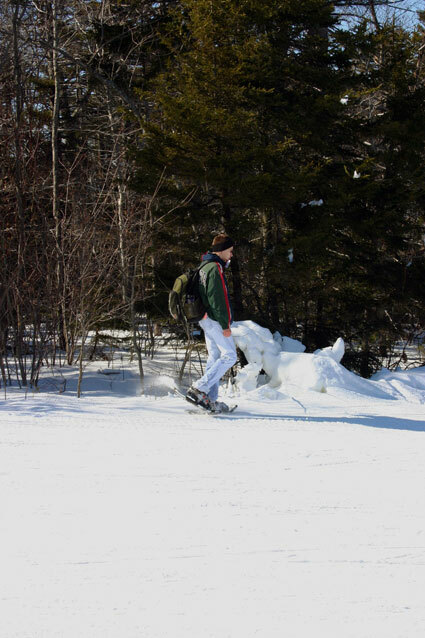 Why not try some snowshoeing along the many trails. 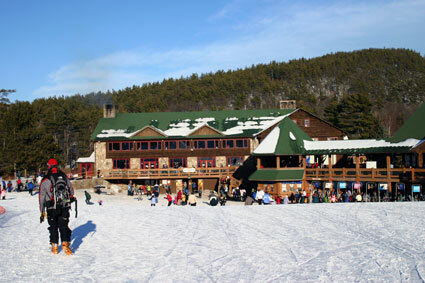 The charming stone and log lodge at Gunstock Mountain dates from the 1930s. The stunning view from the mountain. Stopping at Lighthouse Inn B&B long enough to say hello and change into ski clothes, we went straight to Gunstock Mountain for night skiing, a warm-up for the weekend. First, we stopped into the Powder Keg for dinner. 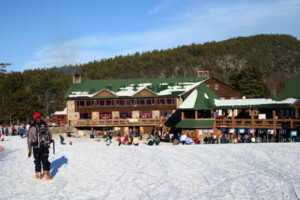 This lively après-ski pub in the base lodge always has a long list of specials, but we chose the house favorite, Black Diamond Salad with steak tips – and since we were planning to burn up a few calories skiing, added a serving of cheese fries. More than half the mountain's terrain is lit for night skiing and lifts run until 10 p.m. Gunstock's Friday Night Special includes free snowshoe demos with a lift ticket. We are not enthusiastic first-tracks skiers so we had time to enjoy our breakfast of fresh-from-the-oven blueberry scones, followed by baked French toast with warm fruit compote. By daylight we got a better look at Lighthouse Inn B&B, built by shipbuilder Byron Hedblom, a well-known figure in the area for bringing the Lake Winnipesaukee cruise boat, the M/S Mount Washington, here. He's the one who added the three 15-foot-tall working lighthouses to the property, which now light the way to the inn's cottages. 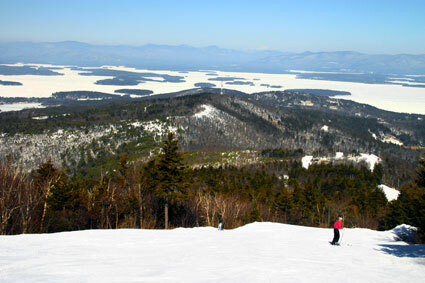 Gunstock had been making snow all night, and conditions were in top form. After a quick warm-up on Popgun and Peepsight, we crossed to Ramrod Quad and skied a few runs on the intermediate Phelps and Ricochet trails. 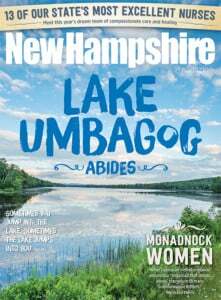 Tantalizing glimpses of the lake lured us to top on Panorama High-speed Quad for one of the state's best mountaintop views: almost the entirety of Lake Winnipesaukee with the snow-covered White Mountains rising behind it. It took a while to get down the mountain on Flintlock and Stonebar, not because the trails were crowded, but because we kept stopping to pull out cameras for new lake views framed by trees. It was time for a break so we dropped our skis at the free equipment check and headed in for bowls of the really good chili in the food court at the base lodge. Our timing was perfect: just as we sat down, loosened our boots and began eating, a wild animal program began. An interpreter from the W.I.L.D. Center & Zoological Park of New England in Rochester began telling engaging facts and anecdotes about six different animals she brought. We learned that the cute furry chinchilla keeps itself clean by rolling in volcano dust and that the elegant white Moluccan cockatoo lives for 100 years. But the show was stolen by a South American porcupine with a prehensile tail. The demonstrator talked about him while he was hanging head-down, his tail wrapped round her arm. We could have spent part of the afternoon on Gunstock's new ZipTour Ziplines, the longest zip line canopy tour in the continental United States. From the summit of Gunstock, the line extends more than 3/4 mile to the top of Pistol, where another set of lines goes to the Aerial Treetop Course. But neither high places nor high speed is my favorite thing, and combined – no thanks. We returned to the summit and skied the other side of the mountain, enjoying the variety of trails, from the wide steeps of Gunsmoke to the narrower, tree-enclosed Shotgun. We ended with a relaxing wind-down on Sidearm, the mountain's only long green trail. There was time to return to Lighthouse Inn for afternoon tea, tempting because we'd heard the glories of Pat's cookies sung by fellow guests at breakfast. But instead we chose some après-ski time at the Pistol Pub, on the balcony of the base lodge, resting our legs before the Ridge Tour at 6:30 p.m. This snowshoe tour began with a chairlift ride (a funny sensation for skiers not wearing skis) before we snowshoed along the ridgeline of Rowe Mountain, our way lighted by headlamps. Views across at the mountain, its trails lit by rows of lights that looked like glittering strings of beads, were beautiful as dusk deepened into night. Luckily there was no need to change clothes before dining at the casual Tavern 27 because after two hours on snowshoes we were more than ready for dinner. We warmed up with crocks of onion soup before working our way through the tapas menu. From the abundant choices, we settled on artichoke hearts topped with local chèvre and candied pecans, chickpea fritters with spicy mayo and chipotle ketchup, jumbo dates stuffed with chèvre and wrapped in grilled chicken, marinated and slow-roasted pork loin with horseradish aioli and fennel jam, roasted root vegetables with maple dijon vinaigrette and grilled sirloin steak skewered with butter-poached crimini mushrooms. We not only liked the variety of well-paired flavors, but we liked the idea that many of the ingredients were locally sourced. Breakfast was a savory soufflé, over which we couldn't linger long because we'd signed up for cross-country ski lessons at Gunstock Nordic Trails. 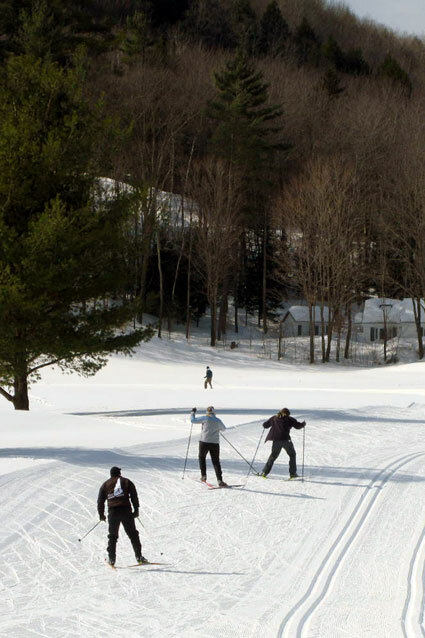 The Mountain Magic program is designed for first-time skiers, but we had not been on cross-country skis for so long that we thought it a good idea to begin afresh. As promised, we were gliding and skating through the woods quite handily by the end of the lesson. The trail system is not only extensive, but winds through interesting and lovely terrain. Since it was another beautiful day, we were tempted to get an afternoon ski ticket and savor the view over lunch at the Panorama Pub on the top of the mountain. But while the spirit was willing, the knees were weak after skiing and snowshoeing almost steadily since Friday evening. 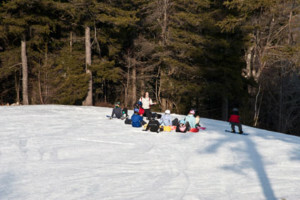 So we rested our knees with a sit-down snow sport at the Thrill Hill Tubing Park, New Hampshire's longest tubing run at 1,068 feet. Unlike other places we've snow-tubed, Gunstock has a lift that took us to the top sitting comfortably in our tubes. As much fun as whizzing down the hill ourselves was listening to the squeals of delighted kids all around us. We've skied at Gunstock since we were kids, and it just keeps getting bigger and better without losing its family atmosphere and friendly feel.